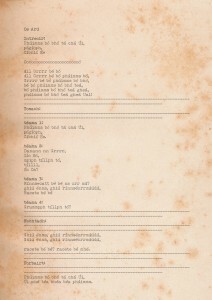 Irish Text Score/Composition by Róisín Madigan O’Reilly, completed between 1925 – 1926. Following exposure to Kurt Schwitters’ experimental work Ursonate in 1925 during a visit to Irmgard Kiepenheuer in Potsdam, Róisín Madigan O’Reilly set about transposing Schwitters’ seminal work into a specifically Irish context. 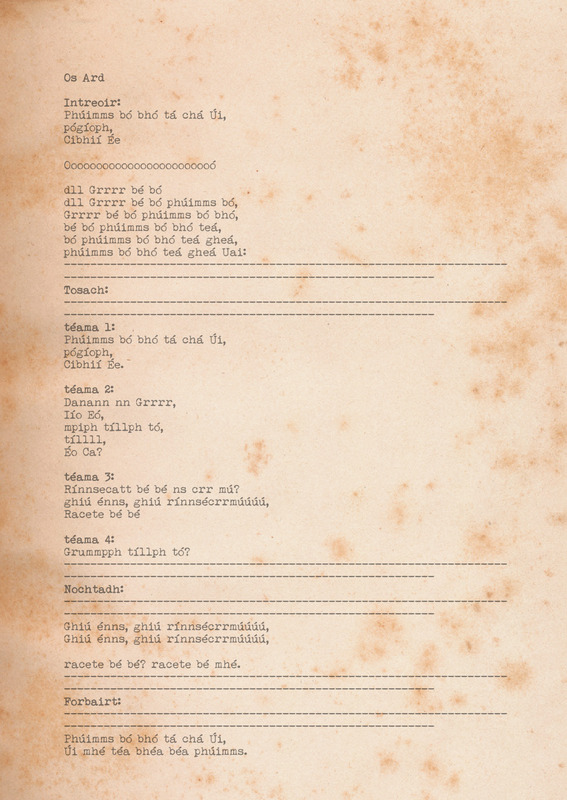 Schwitters’ idea of a “Primeval Sonata” spoke to Madigan O’Reilly’s instincts to work with the bare bones of the Irish language and to find forms of expression which would allow her to work with its fundamental aural palette of pronunciations and characters. 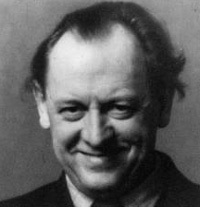 To produce an Irish translation of Schwitters’ score she firstly eliminated any characters in Schwitters’ original not found in the Irish alphabet. She also switched many of the umlauts in the German original for combinations of vowels or vowels with an acute accent (fada in Irish). The titles denoting each section of the work and the descriptive Spanish terms used in Schwitters’ original to denote tempo and mood etc. were also replaced with Irish equivalents in Madigan O’Reilly’s transposition, and she titled her new work Os Ard (which means openly or publically) to differentiate it from Ursonate (which means primordial sonata), emphasising her political interest in making the Irish language once again the dominant sound in Irish public life. Schwitters’ original work is comprised of several key phrases which are dismantled, rebuilt and repeated to create rhythmical sections and Madigan O’Reilly’s Irish version is remarkably faithful to this original structure. However hers is not an exact match-for-match translation; in aiming for a quintessential Irishness in the phrases she has replaced certain nonsense words with references to Irish mythology, and has swapped some consonants for combinations which echo spoken Irish more than those used in Schwitters’ original. Compare the phrase “Dedesnn nn rrrrr” from Schwitters’ Ursonate with Madigan O’Reilly’s “Danann nn Grrr”; The replacement word for “Dedesnn” is a direct reference to The Tuath Dé Danann, a race of supernaturally-gifted people in Irish mythology thought to represent the main deities of pre-Christian Ireland. Also, in place of the hard Rrrrrrrrrrs of Schwitters’ original primeval sonata, Madigan O’Reilly’s uses soft Grrrrrrrrrs, in reference to the Irish words for love, grain, fragments (grá grán grabhar) and other words pertaining to the fundaments of human existence. 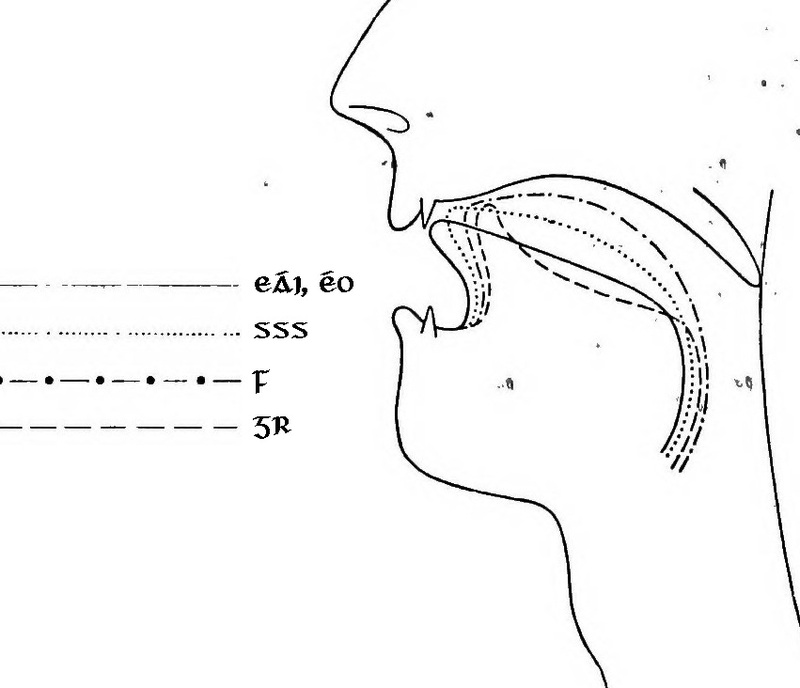 Though she lived in the Gaeltacht towards the end of her life and her diaries reveal that she wondered about changing more of the sounds in Os Ard to actual Irish words, it seems that Madigan O’Reilly decided to keep the sounds as fragments of words and to let the sounds of those fragments speak for themselves: in 1970 after much deliberation and many drafts and re-drafts, her only change to her earlier text was to painstakingly render it in calligraphic script, losing all the visual reference in her original version to the written languages of invading cultures. This entry was posted in Graphic Scores, Noise, Vocal, Women. Bookmark the permalink.